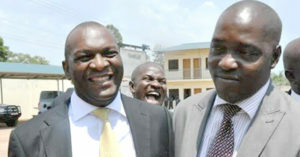 Jinja mayor Majidu Batambuze (left) with former mayor Mohammad Baswale Kezaala. JINJA–Jinja mayor Majidu Batambuze has said mayors are powerless and cannot influence policy. Batambuze said he did not know that most powers in municipalities belong to town clerks when he set out to campaign for mayorship. “Even when I give a directive, it cannot be implemented because as the political head, I am powerless,” Batambuze said. Batambuze who also doubles at the chairperson of the Urban Authorities Association was addressing journalists at his office today morning. He said he is not even allowed to sign cheques as all that is done by the town clerk. “When I was campaigning, I promised to tackle issues such as lighting up the town, improving garbage collection and improving the poor road network,” he said. He said he promised to transform Jinja town but he has been frustrated by the technical team led by the municipal town clerk Francis Byabagambi. Batambuze’s comments follow a foiled protest by a group of youths who stormed the town clerk’s office demanding that he vacates but were later dispersed by police. Byabagambi couldn’t be reached for comment as he could not answer our repeated calls.